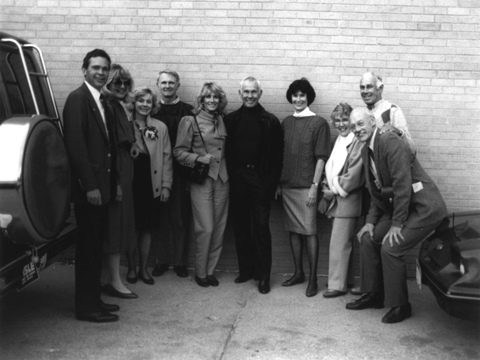 In this undated photo taken outside the Johnny Carson Theater at the Lied Center, Carson (center) stands with a number of people. Right of him is the late Sheila Griffin, who was an early director at the Lied. On the far left is Terry Fairfield, CEO of the NU Foundation. Members of the university community who knew alumnus Johnny Carson praised his legacy as a comedian and philanthropist. Kerry Acker, assistant to the dean of the College of Law, picked up the phone and got a pitch for what sounded like a money-saving deal on copy machine toner. The caller, claiming to be affiliated with the college's office machine vendor, said toner prices were on the rise and the vendor had held back some at the old price. A groundbreaking celebration for the University of Nebraska/Kimmel Education and Research Center occurred in Nebraska City on Jan. 25. The installation ceremony of University of Nebraska President James B. Milliken is 10 a.m. Jan. 27 at UNO' Strauss Performing Arts Center, 6001 Dodge St., followed by a public reception in the ballroom at UNO Milo Bail Student Center. The UNL community is welcome to attend or watch the installation on campus channel 4, or live on the Web at www.nebraska.edu. The installation ceremony will also be rebroadcast at 9 p.m. Jan. 27 on NETV-2. Academic Affairs received 100 proposals for its Initiative for Teaching & Learning Excellence, according to initiative director Dave Wilson. Topic areas are Advising for Life, 12; Learner-Centered Classroom Development, 15; One Campus, Many Views, 7; Program Innovation, 34; Teaching Fellows, 6; and Teaching & Learning with Technology, 26. The St. Petersburg Ballet Theatre of Russia performs at 7:30 p.m. Jan. 29 in the Lied Center for Performing Arts. The troupe will present The Russian Season, which includes three pieces: "Chopiniana" with music by Frederic Chopin, "Capriccio Italien" with music by Pyotr Ilyich Tchaikovsky, and "Scheherazade" with music by Nikolai Rimsky-Korsakov. Mamma Mia!, the smash hit musical based on the songs of ABBA, is coming to the Lied Center for for eight shows Feb. 1-6. U.S. Poet Laureate Ted Kooser will discuss his new book, Poetry Home Repair Manual; Practical Advice for Beginning Poets, at a Lee Booksellers Edgewood Center book signing at 2 p.m. Jan. 30. The store is located at 5500 S. 56th St. The Biennial Juried Student Exhibition runs in the Robert Hillestad Textiles Gallery until Jan. 28. The Women's Center is accepting submissions for an art gallery celebrating Women's Month to be located in the Loft Gallery in the Nebraska East Union during the month of March. Submissions are due to the Women's Center, Nebraska Union, Room 340, by Feb. 11. For rules on submitting art or for a submission form visit: http://si.unl.edu/involved/womens_center/.